The Rotating Wireless DR Tray with Cabinet is a great addition to an X-Ray system looking to upgrade to Wireless DR. 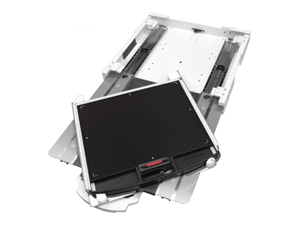 It is designed for Lock-N-Secure® II Panel Protection upgrades to an existing table or wallstand. This rotational tray eliminates the need to remove the wireless digital 14x17 (35cmx43cm) receptor from the tray when changing orientation. A light pull by the receptor handle rotates the tray to either the portrait or landscape detent position without the need to physically remove the costly DR wireless panel. Accommodates many common existing mounting hole dimensions & locations, grid and AEC chamber, which minimize any impact to the overall system. Must be purchased with Lock-N-Secure® II DR panel protector.